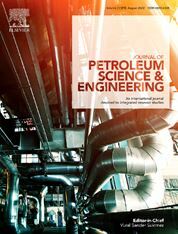 The objective of the Journal of Petroleum Science and Engineering is to bridge the gap between the engineering, the geology and the science of petroleum and natural gas by publishing explicitly written articles intelligible to scientists and engineers working in any field of petroleum engineering, natural gas engineering and petroleum (natural gas) geology. An attempt is made in all issues to balance the subject matter and to appeal to a broad readership. The Journal of Petroleum Science and Engineering covers the fields of petroleum (and natural gas) exploration, production and flow in its broadest possible sense. Topics include: origin and accumulation of petroleum and natural gas; petroleum geochemistry; reservoir engineering; reservoir simulation; rock mechanics; petrophysics; pore-level phenomena; well logging, testing and evaluation; mathematical modelling; enhanced oil and gas recovery; petroleum geology; compaction/diagenesis; petroleum economics; drilling and drilling fluids; thermodynamics and phase behavior; fluid mechanics; multi-phase flow in porous media; production engineering; formation evaluation; exploration methods; CO2 Sequestration in geological formations/sub-surface; management and development of unconventional resources such as heavy oil and bitumen, tight oil and liquid rich shales. Papers will be published with the minimum of publication delay. Research articles, case histories, field process reports, short communications, book reviews, symposia proceedings and review articles are accepted. Generally, review articles on some topic of special current interest will be published.